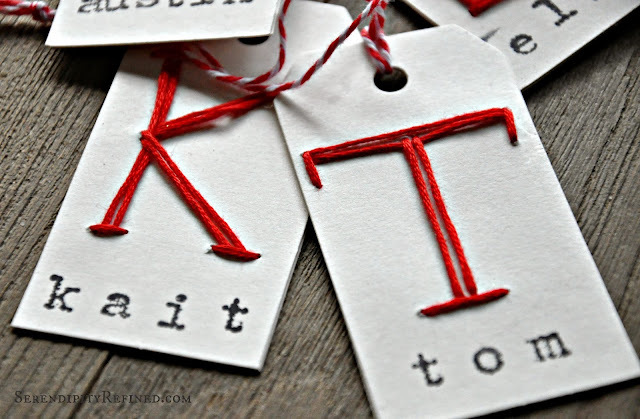 Today, I'm sharing some easy Embroidered Monogram Gift Tags. Of course, I'm wrapping. 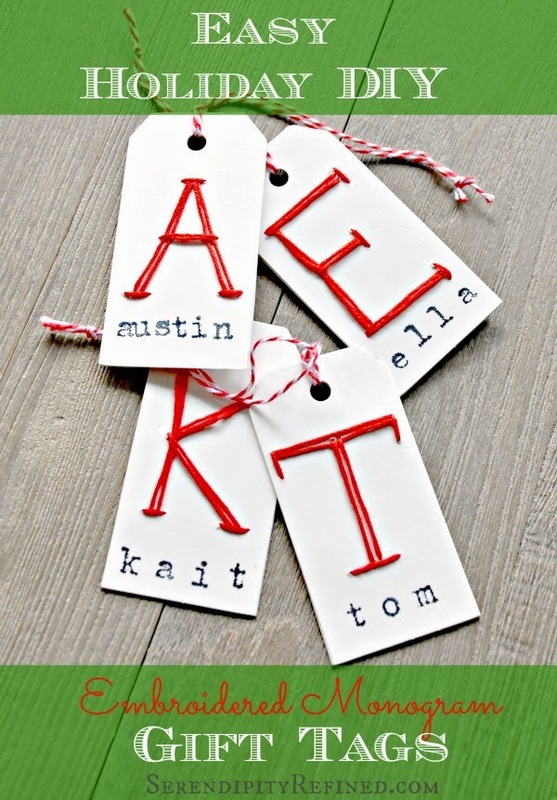 After all, it's one week until Christmas! Can you believe it?! ONE WEEK! How in the world did this happen?! Honestly, I feel like I barely emerged from my Thanksgiving food coma and suddenly, it's the third week of December! I'll admit that I've been busy but I seem to have lost an entire Month! I've finally finished with my shopping (well, most of it) and I'm now in full-on "paper and tape" mode. Of course, I haven't managed to unearth whatever box it is that contains the gift wrapping supplies (are you sensing a theme here!?) 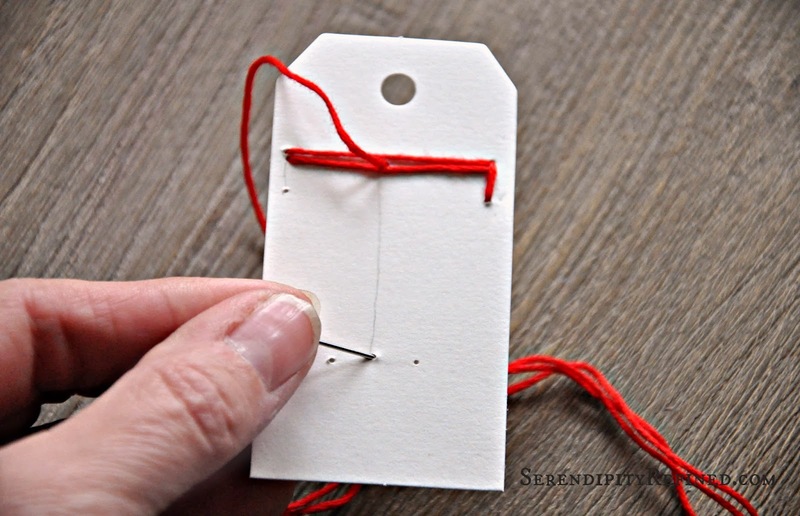 but I found the box with my scissors, and embroidery supplies last week so I knew that was half way to tags! 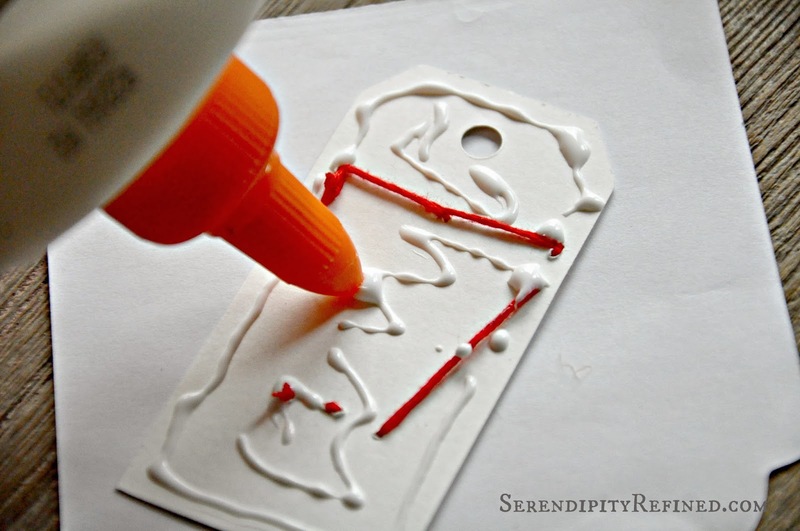 I'll admit, in the days after Thanksgiving, simply writing the names on the packages with black Sharpie marker was a possibility. I think that the butterscotch pie made me lose my mind for a second. The materials are simple: card stock cut into a tag shape and hole punched or pre-cut blank tags, a sharp embroidery needle embroidery floss and a pencil. 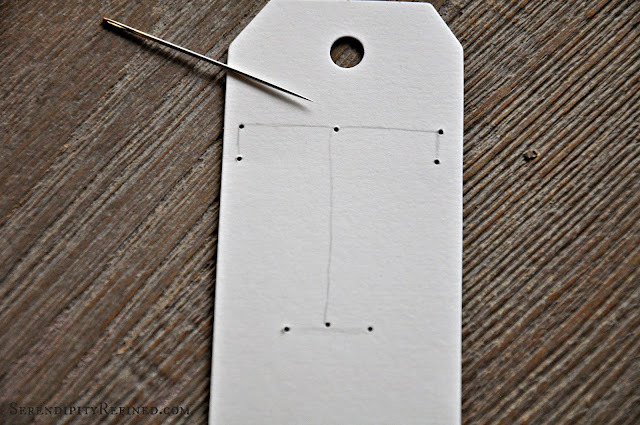 Sketch the letter onto the tag in pencil then use the needle to pierce the points where the stitching will end. Then stitch the letter. I made two stitch lines for the main parts of the letter and one stitch line for the serifs at the ends. 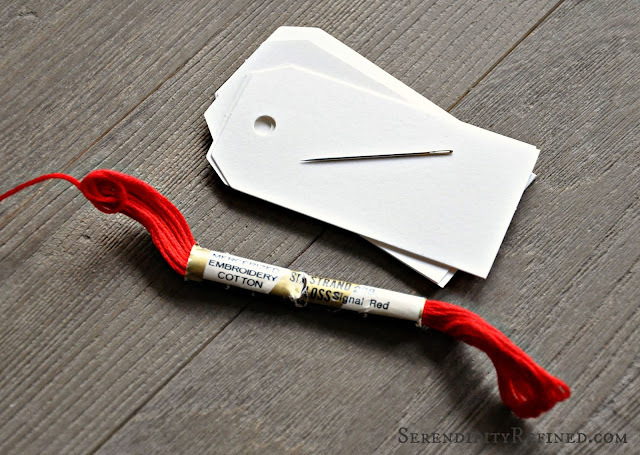 I'm not tidy when I embroider so to make the back look nice, I glued a second tag to the wrong side of the embroidered one. 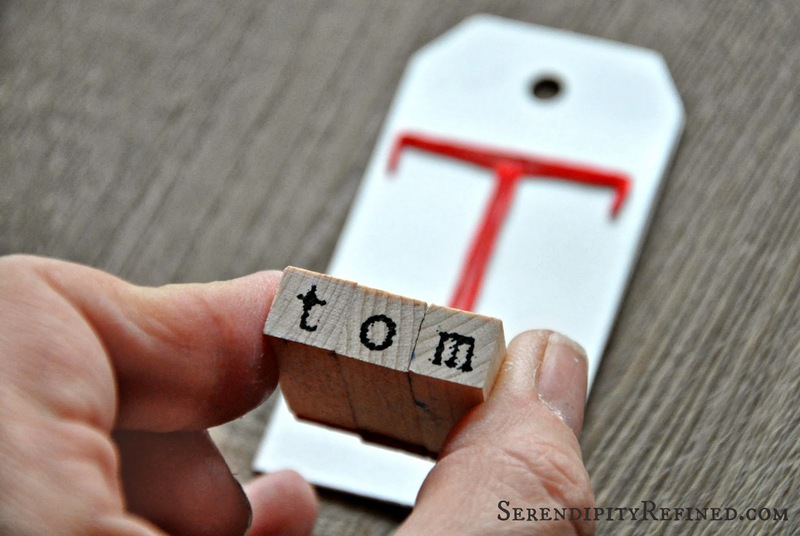 Then, because we have duplicate names and initials in my extended family, I stamped names beneath each monogrammed letter. This is optional, of course. 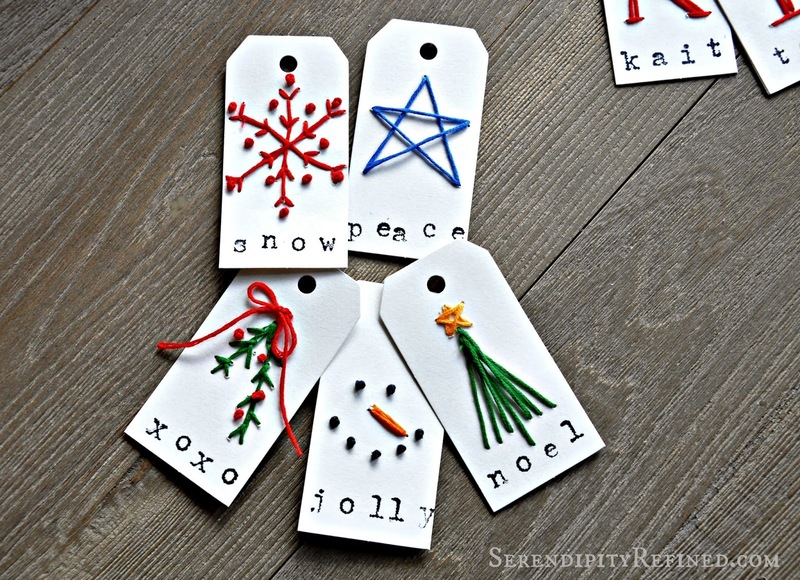 I also decided to forgo the "From" on these tags because I'm fairly certain that the recipients are going to know who these gifts came from. 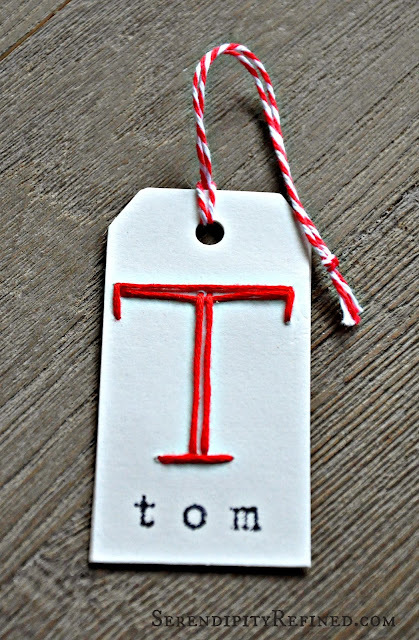 After my embroidered monogram gift tags were complete and since I had my stash of floss all over the kitchen table anyway handy, I also made a few general purpose embroidered holiday gift tags for those gifts that I'm sure that I'll forget about until the last minute. Please tell me that I'm not the only one who does this....and that I'm not the only one with empty boxes from Christmas decorations still stacked in the hall and the kitchen waiting to be taken to the basement?! Heck, at this point, I'm considering just leaving them...after all, it's only a week and then I'll be refilling them! 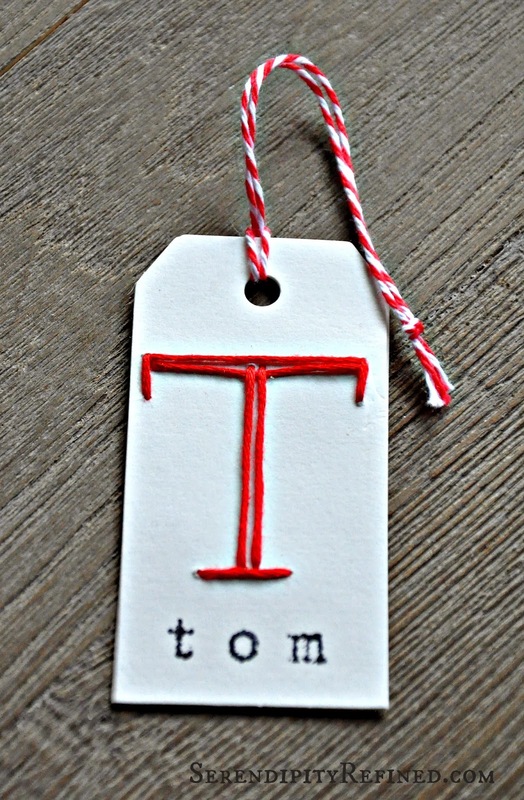 In the mean time, I'm going to try to get my wrapping finished today...now that I have cute gift tags to put on them! My 2014 Word of the Year: Inspire! Merry Christmas and Thank you. My Favorite Poem.